New news for new shoes. There's not really anything about shoes in this post. Except for this: I need new shoes. Probably. My favorite ones are torn and the other ones have laces, which I don't like. Anyway, I'm living in Italy now, and working on independent stuff. First main project is off the ground. I'm working on a puzzle game, which has actually been made before, but I'm adding a little something to it. The puzzle works the same way as Fill-A-Pix or Picma Squared: You have a grid of cells, some of which have numbers in them. The numbers say how many of the 8 surrounding cells and itself are colored in. Using logic, you fill in or rule out all the cells and you're left with a picture! What I'm making is an editor where people can make their own puzzles and share them with friends (or enemies). Basically, they draw their own picture and my game generates the number placement to make a uniquely solvable puzzle. You can see above the current state of the game. The basic input works, meaning you can click on cells to cycle through filled in, crossed out, or blank. There's also a little preview window that's budding just to the right of the main part. 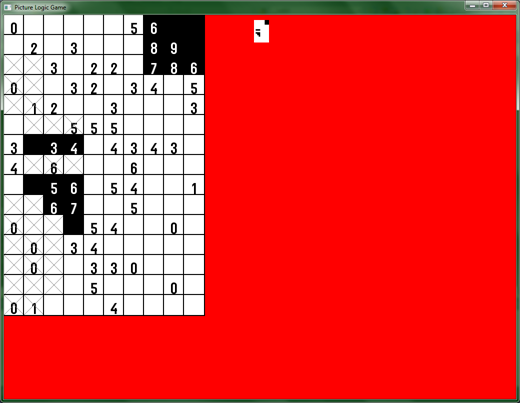 I've implemented a solver which can solve the most basic of puzzles. There are a lot of patterns of solving you can discover as you play harder puzzles, so the plan is to build the solver up so it can verify a solution for any generated puzzle.